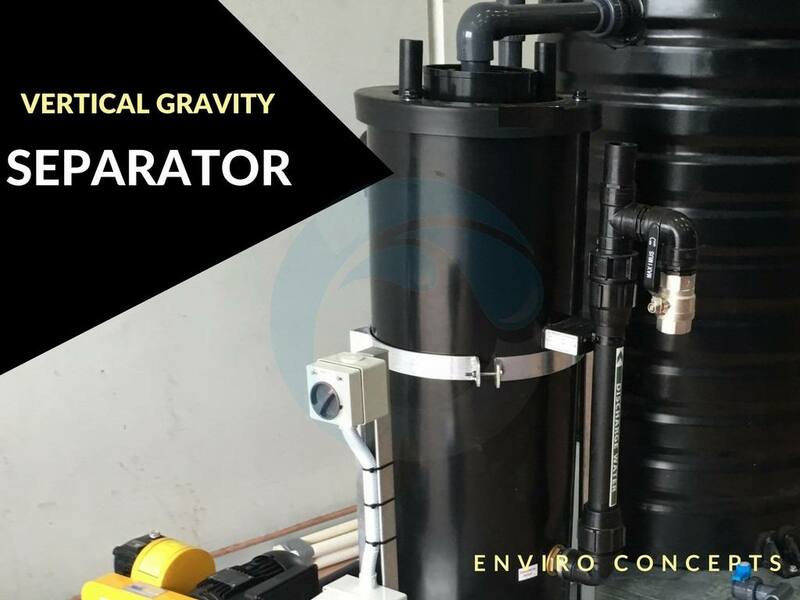 The Vertical Gravity Separator (VGS) is an Oil Water Separator that effectively removes free oil, grease and low density suspended solids from wastewater. The Enviro VGS has a modular design and can cover flow rates from 1000 L/h up to 3000 L/h. It can therefore serve small to large businesses across industries such as mining, manufacturing, oil and gas and automotive companies, from mechanical workshops to large car dealerships. The VGS is designed to enhance the naturally occurring separation between oil and water and work based on the density difference between oil, suspended solids and water. The inlet and outlet column of the Vertical Gravity Separator form a U-tube configuration. When the oily wastewater passes through the column, the free oil and low density suspended solids are trapped on the sides of the central column while the treated water flows out the other side. Denser solids usually settle at the bottom and the oil and lighter solids float to the top of the VGS. The layer of oil is then basically skimmed off and disposed while the solids sediment is drained or pumped out. The treated water can then be transferred to further downstream treatment (or discharged). The Enviro VGS is able to meet the performance standards of local council and regulatory authorities in respect to Hydrocarbons, Suspended Solids and Total Oil and Grease. The VGS uses a cylindrical design and it takes up less space than other types of OWS. Its unique design enables quick cleaning of the unit. There is no need to use high pressure jets or chemicals to clean the VGS as is the case with some other OWS models. The Enviro Concepts VGS is often used as part of our SIOS Water Treatment Discharge Package as the preferred pre-treatment device in the process. For more information on VGS, or to get a free estimate for an Oil Water Separator for your business, contact us.